The distinguished Briolette Diamond Necklace is a magnificent piece that has a perfect briolette diamond as its centerpiece. It has more than 75.36 carats weight plus it has an incredible marquise diamond of a purple-pink shade attached. With its 18 carats white gold chain, its value reached $11.1 million and distinguished to be a very expensive jewelry in the world. Cartier Paris’ Panther Bracelet is distinctively formed like a panther, decorated with onyxes and diamonds. It is owned by an American trendsetter and Duchess of Windsor Wallis Simpson. Its value reached $12.4 million in an auction. Custom-made in 1900 by German Prince Guido Count von Henckel, as a precious lovely present for his second wife, Princess Katherina Henckel von Donnersmarck, the exquisite Emerald and Diamond Tiara is believed to be originally owned to the wife of Napoleon the III of France. 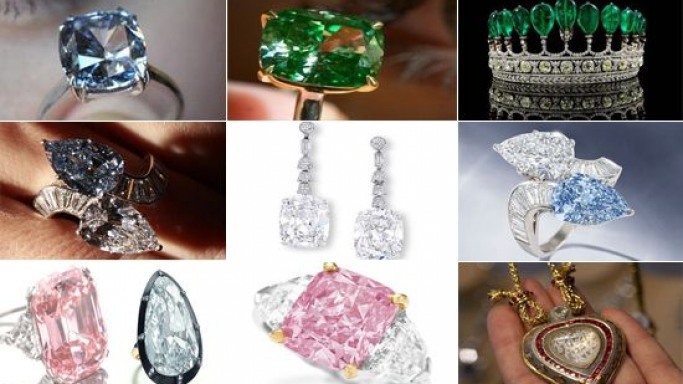 Its value reached an amazing price of $12.7 million at the Sotheby’s Magnificent and Noble Jewels sale. Garrard, one of the most esteemed jewelry companies created a very expensive jewelry piece – Heart of the Kingdom. It has an extraordinary Burmese ruby of 40.63 carats, designed like a heart shape. It is an exceptionally uncommon ruby, and is attached on a 155 carat diamond chain, decorated with 150 diamonds. Its value is $14 million. The Bulgari Two-Stone Diamond Ring was created in 1972. This ring has two wedge-shaped diamonds – one is a brilliant blue diamond with 10.95 carats, and a colorless one weighing 9.87 carats. This brilliant ring shows the color, lucidity and purity of the two diamonds. An Asian jewelry collector brought home this jewelry piece at $15.7 million, after an aggressive bidding fight, and it’s one of the world’s dearest rings. 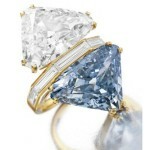 The Chopard’s Blue Diamond Ring is an undeniably superb adornment. 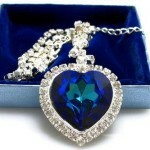 It is a very expensive jewelry piece because of its blue diamond. Blue diamond is extremely sought-after because its exclusivity. 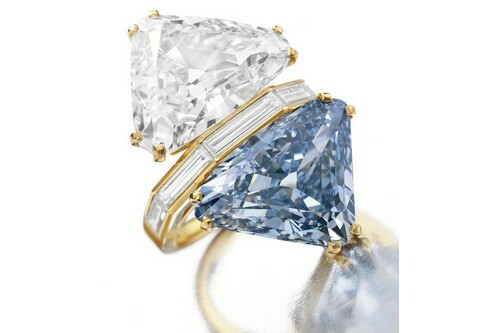 The ring by Chopard has an oval-shaped blue diamond with 9 carats weight and it is set in white gold of 18 carats, along with trilateral clear diamonds on the rims. 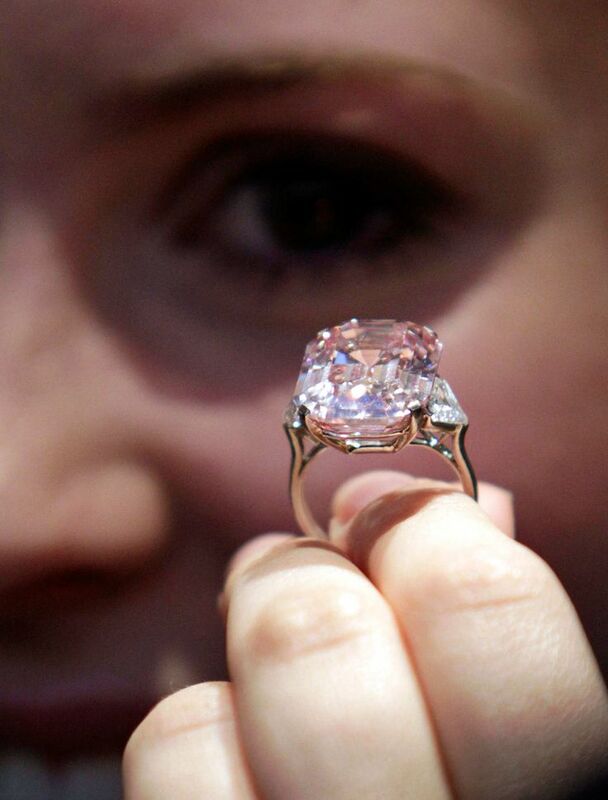 This unusual and stunning ring is prized at $16.26 million. 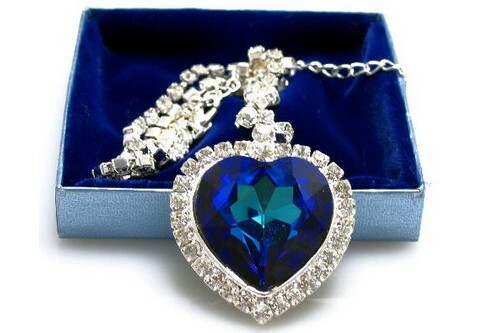 The Heart of the Ocean the original copy of the fantastic necklace presented in the movie, Titanic. Gloria Stuart, who portrayed Rose in the movie, wore this copy to the 1998 Academy Awards. It was fashioned by the renowned jeweler Harry Winston. It has a real blue diamond of 15 carats. It is valued at $20 million. It is valued at $23.2 million. This piece contains a 14.23 carat deep pink diamond, which is unusual, due to the particular shade, and perfect color, shape and lucidity. It has a 244 years of auction history. It is bordered on either side by two colorless diamonds, weighing 1.73 and 1.67 carats. The three quadrangular diamonds are set a delightful rose and an 18 carats white gold ring. 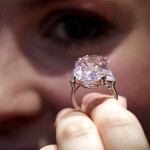 Jewel collector Laurence Graff got The Graff Pink for $46.2 million. This elegant ring, has a pink diamond of 24.78 carats, an unusual type II color diamond with the best rating, labeled as one of the best diamonds found. The pink has a perfect quadrangular step cut, with finely rounded angles, and is attached between two shield-shaped diamonds. The three stunning diamonds are on on a platinum ring. The L’Incomparable Diamond Necklace is the most treasured necklace in the world. This diamond piece has 637 carats. The Incomparable diamond is colored yellow and weighs 407.48 carats. It was discovered thirty years ago by a young girl, when it was a huge 890 carat by-product of a diamond excavation, and acquired the Mouawad Jewelry of about 4 years to refine it and form it into a beautiful necklace of $55 million worth with 91 diamonds of several cuts, which includes 229.52 carat white diamonds, set in 18 carat rose gold. Next Article How Many of these Dogs can You name?